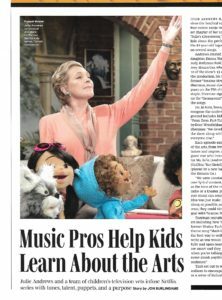 Coming under the category of “boy, do we need it now” is the new children’s series demystifying the arts, Julie’s Greenroom on Netflix. It’s the creation of Julie Andrews and her daughter Emma Walton Hamilton and each half-hour episode explores a different facet of the theater, from writing and acting to costumes and music. There are songs and score in each show, so for this story in Variety I interviewed music director Bill Sherman, composer Ryan Shore and songwriter Shaina Taub. At a time when arts funding is threatened on both national and local levels, this show is really special and deserves our support (and anyway, there are Muppets in it!). This entry was posted in Composers, Interviews, Television Music and tagged Bill Sherman, Emma Walton Hamilton, Julie Andrews, Julie's Greenroom, Muppets, Netflix children's series, Ryan Shore, Shaina Taub, Variety on April 12, 2017 by Jon Burlingame.